Offices of career services have been a mainstay of American college campuses for decades. And they’ve had a consistent goal: to help undergraduates land the kind of satisfying jobs after graduation that make use of their educations and skills. But within that stable framework, there’s been a sea change in the way that college career guidance takes place. 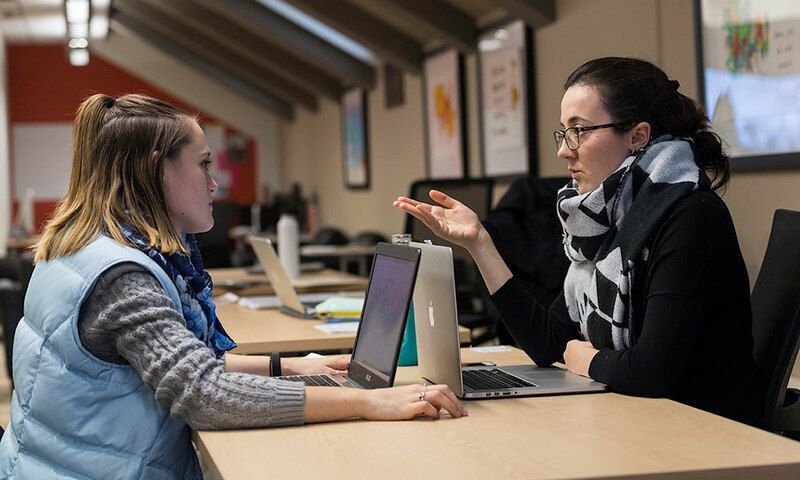 At the University of Rochester, the paradigm shift is written into name of the career services office itself: Gwen M. Greene Center for Career Education and Connections. What’s your dream job? What do you want to be? Every five-year-old has a quick answer or two to this question. But once you are at university it becomes more pressing. The question becomes—how do you land a real job straight out of college? That means helping students to make connections, form relationships with prospective employers and mentors, and view their skills in new ways. The Greene Center has introduced new initiatives to advance those missions. For example, it features Handshake, a job and internship search data base where students can schedule an advising appointment, find internship and employment opportunities, discover when employers are coming to campus, and connect with alumni and employers. When you create a profile, employers can read it. Morgan Albert ’16 landed a bridge-year position with Kuchnir Dermatology when she met with recruiters from the Boston-based company at the Greene Center last year. She plans to attend medical school in the fall and credits the Greene Center with setting her on the right path. The Greene Center has also incorporated the tools of data science. In 2016 Testani hired Vanessa Newton as the center’s first director of assessment data and operations. The data is also helpful for companies who contact the Greene Center looking to recruit students. “We can tell them what a competitive offer is,” Newton says. The circumstances are different—but the focus is the same—at the Eastman School of Music. Hundreds of students leave with music degrees each spring, and many develop unique careers that combine performing, teaching, and composing music, as well as a variety of entrepreneurial activities. Jim Doser ‘79E, ‘84E (MM), director of Eastman’s Institute for Music Leadership, says there are only about 250 full-time orchestra jobs available annually in North America—and thousands of graduates with music degrees who are qualified to fill them. A recent survey of Eastman graduates showed that 62 percent of undergraduates and 76 percent of graduate students from 1990 to 1999, immediately upon graduation, found full-time careers in music. But the numbers dropped to 45 and 60 percent, respectively, from 2010 to 2015. Given the changing nature of the job market for musicians, the Institute for Music Leadership has stepped up to help students develop the tools to successfully launch their careers in this constantly evolving environment. The institute offers advising, one-on-one counseling, workshops and networking opportunities with alumni and professionals in the field. “More and more students come to Eastman expecting and valuing that they’re going to be able to create a career that has diversity, variety, and creative outlets, as opposed to just working in a single musical institution for 30 or 40 years,” Doser says. The institute offers programs that will drive students toward successful careers which may (or may not) include music exclusively. The Catherine Filene Shouse Arts Leadership Program focuses on teaching students entrepreneurship and communication skills, fluency with emerging technologies, and public advocacy for music and the arts. It offers courses such as Entrepreneurial Thinking and Career Skills for the 21st Century. The Beal Institute for Film Music and Contemporary Media was launched in 2015 following a $2 million commitment from Emmy-winning composer Jeff Beal ‘85E and his wife, professional vocalist Joan Beal ‘84E. The institute prepares students for career opportunities in an ever-changing field and matches them with less traditional career possibilities, such as film scoring, and composing for video and virtual reality games. Eastman introduced a Master of Arts in Music Leadership degree last year, to develop leaders who understand the opportunities and challenges in a 21st-century musical landscape. The Simon Business School is ranked in the top 10 among business schools for employment outcomes. Simon’s Career Management Center plays a large role in that success. To address the workforce’s demand for STEM (Science, Technology, Engineering, and Math) skills, three out of four Simon MS programs are STEM-certified. 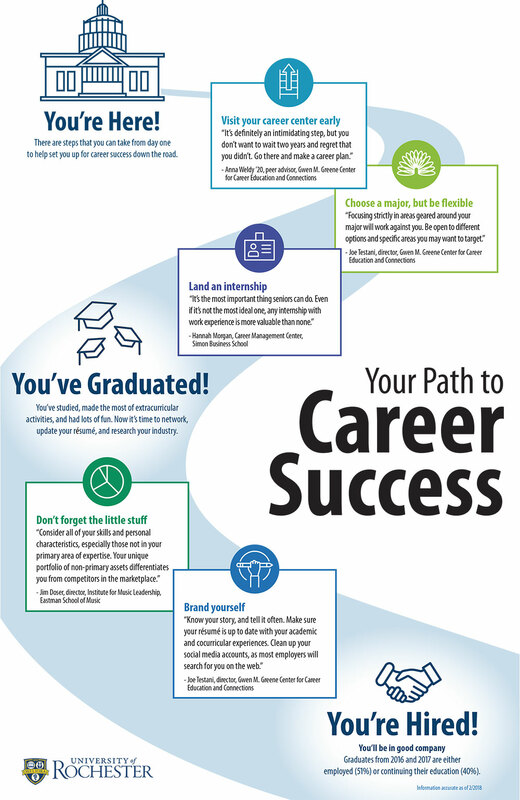 The Career Management Center partners with every student, helping each one to prepare for job searches, engaging in more than 200 hours of career programming during the academic year. The center team also facilitates networking opportunities through national career fairs, corporate visits, and engagement opportunities with alumni in major cities across the nation. Students have access to SimonWorks, a comprehensive online recruitment and research system that lets them register to attend workshops and events, schedule appointments with Career Management Center staff and Simon career advisors, and search for and apply to internship and job opportunities. “We have alumni from certain clusters of industry who not only advise our students, they also work with the professors to make sure the curriculum is cutting edge and preparing students with all the knowledge they need to be successful,” says Hannah Morgan, assistant director for working professionals at the Career Management Center. Morgan is also the founder of Careersherpa.net, where she offers advice on finding employment, social networking, and building a successful career. “It’s amazing how many new job types exist today that didn’t exist 10 years ago,” she says.